A Zero Energy House produces as much energy as the people living in it consume. Our house generates energy via roof-integrated solar photovoltaic panels and roof-mounted solar hot water panels. We don't store energy on-site so at times will rely on a connection to the electricity grid for power. But at other times we'll push surplus energy generated on-site back to the grid. Over the course of a year the amount of energy we consume from the grid and the amount we push back will cancel each other out to result in a net Zero Energy balance. In Zero Energy Explained we discuss what Zero Energy is, why we chose to aim for it, and how we're going to get there. How does Zero Energy compare with Sustainable, Green, or Eco building? Each of these approaches use principles and methods that are environmentally conscious and resource-efficient. While the Zero Energy target is focused on energy our home has also been designed and constructed in accordance with these principles. We've selected products that are manufactured, used, and disposed of with the environment in mind, have implemented waste minimisation measures, and, by adopting Zero Energy, will be reducing our carbon emissions. But while Zero Energy incorporates principles from these other approaches, by definition it is very different. Sustainable, green, and eco buildings all strive to reduce outside energy needs and associated impacts; a Zero Energy House seeks to eliminate them. Zero Energy is also different in that it is an explicit target. Two houses with very different levels of attention paid to sustainable methods can both claim to be 'sustainable,' but the Zero Energy target means a house is either Zero Energy or it is not. There are three main reasons to build a Zero Energy House. Every person building a house has a key figure in mind - the cost to build. This helps them understand how much they need to borrow from the bank and how much they'll pay back over a 25-year mortgage term. The average Auckland household will spend $50,000 on power over a 25-year period, even more as prices continue to rise. But there is another figure that is equally important - the cost to operate. A BRANZ study found the average Auckland home used 7,970 kWh of electricity a year1. At the 2010 rate of 25.5c per kWh2 it meant an annual cost of over $2,000. Over the 25-year term people pay back the investment in their house they'd be spending more than $50,000 on electricity. But that's based on 2010 price levels. Adjusted for inflation, residential electricity prices have almost doubled in the past 25 years2. Last year alone prices for some households went up by almost 12%. On top of all that, privatisation of the energy industry has many people thinking power prices could rise by even more. That $50,000 spent on powering a house for 25 years could conceivably be much, much more. And energy isn't only costly for homeowners, it affects the country as a whole. Increasing energy demand will mean increased supply, resulting in the need for more power stations and ongoing maintenance and upgrades to the national grid (much of the 12% power price increases mentioned above were to cover a recent upgrade). As a country we can reduce these costs and risks by moving towards on-site or locally generated power. We've done the sums and believe the investment in Zero Energy makes economic sense. Once we're settled into the house we'll publish that 'cost to build' figure - but we'll also publish real-time energy generation and consumption data, along with the monthly 'cost to operate' for everyone to see. While a large amount of New Zealand's electricity comes from hydro-power, in a normal year we still rely upon non-renewable sources for a quarter of our needs3. And hydro-power has risks. We've had warnings about low lake levels in 2001, 2003, 2006, 2008 and as recent as 2012. When lake levels are low fossil fuels are brought in to take up the slack, and with a growing population and energy demand that scenario could occur more and more often. We're also dependent on a vast transmission network to move power around the country - more than 70% of Auckland's energy has to be imported from outside the region. Not only is this network expensive to maintain, it's inefficient. Transmitting electricity results in energy being lost, meaning we have to produce even more of it at the source to make sure there's enough when it reaches the destination. On-site solar generation reduces dependence on the fossil fuels that make up a portion of electricity supply, reduces reliance on the right weather conditions (solar panels capture energy even on cloudy days), and reduces energy loss by transmitting energy a short distance from the roof to the ground. One of the key Zero Energy design principles is to minimise the amount of energy that needs to be generated. 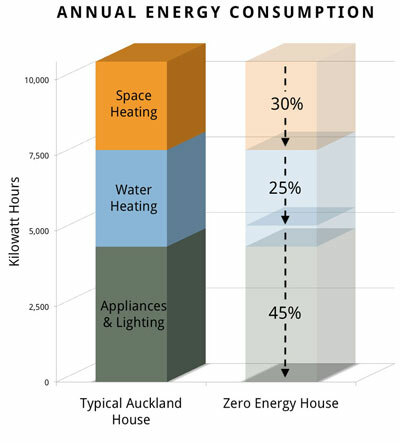 The typical Auckland house uses around a third of its energy to heat the home4; we have designed the Zero Energy House to avoid the need for heating (or cooling) altogether. The house doesn't require heating, which means we don't need to spend money to stay warm and dry as energy prices increase. A 2008 study found more than 400,000 New Zealand homes are cold and damp enough to make their inhabitants sick. Not only does this affect the people living inside them, but it costs the country more than $70 million a year in hospital bills and lost productivity. By creating an indoor environment that is warm and dry the Zero Energy House eliminates these health risks. And by doing so without requiring heating it means we don't have to worry about spending money on power to stay warm and dry as energy prices increase. Finally, by achieving this result without mechanical heating we're avoiding the cold spots common in many homes where living areas are heated but other areas (including bedrooms) are not. 45% of New Zealand homes have visible mould in cold areas like these, which can result in serious health effects. How will we achieve Zero Energy? Building envelope design. The shape and construction methods used will eliminate the need for any heating. This normally accounts for around 30% of a standard home's energy use (and bill). Solar hot water heating. Most of the hot water needs are provided by a roof mounted solar system. The system being used is made in New Zealand and reduces energy needs by a further 25%. Solar photovoltaic (PV) panels. 88 of them laid out on the north-facing side of the roof will provide the remaining 45% of energy. Building Research Association New Zealand (BRANZ). (2006). Energy use in New Zealand households: Report on the year 10 analysis for the household energy end-use project (HEEP). p18. Ministry of Economic Development. (2011). New Zealand energy data file: 2010 calendar year edition. p130-131. Ministry of Economic Development. (2011). p104.